After a turbulent 2016, I enter the new year with inspiration renewed and a vow to work through my review backlog, which is extending at an unprecedented rate. 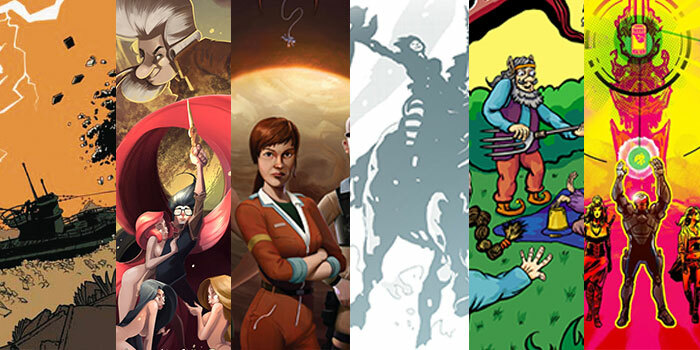 On average, I currently receive a good 4-6 submissions for indie comics per day, so sadly I have to rummage through them and grab at whatever takes my fancy there and then. 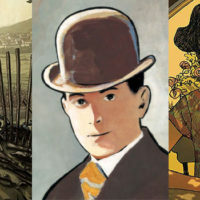 Consequently, this month’s reviews are a bit on the short side, but you can always use the links to discover the featured works for yourself. Enjoy! The wonderful thing about taking a chance on indie or creator-owned comics is that you never know what to expect. To describe Romain Baudy and Martin Trystram’s Pacific as a psychological thriller set on a World War II German U-Boat is both accurate and a bit of a sidestep. It’s a book that slowly and insidiously gets under the skin, a work of magical realism that keeps its secrets close to its chest and stays in your mind days after you’ve read it. When young radio operator Udo joins the crew of German submarine, he brings with him a book banned by the Nazis, one which is swiftly destroyed. However, the book soon reappears and, against the unhinged Captain Kaleunt’s attempts to keep it off his ship, seems to be multiplying. The art, by Kyung-Eun Park and Trystram, is exaggerated but never irreverent towards its subject matter or humble characters, and the book’s landscape format makes it a joy to read on digital devices. 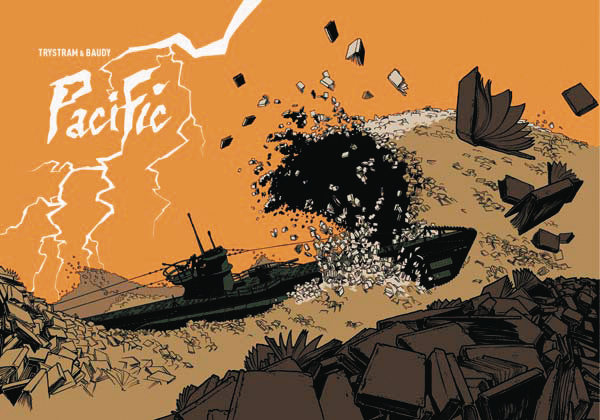 Pacific is available now, from Titan Comics. 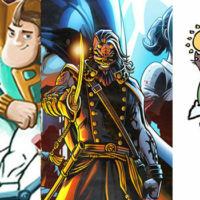 Of all the comic genres to attempt, the wacky all-ages comic must be the most difficult one to get right, chiefly because so many of them are crap. Yet as Bob Holbreck the non-union psychic returns for another ghostly adventure, I immediately remembered just how much I enjoyed his pilot outing. ‘The Legend of Legros’ kicks off this ongoing series, with Bob discovering that his lucky golden scissors belonged to legendary eighteenth century hairdresser Legros de Rumigny, and carry with them both great power and a great curse. Cue a battle against evil wigs. It’s knowingly nonsense, of course, but Lance Lucero and Adam Volle’s hilarious script constantly hits the right notes. Francisco Resendiz’s art is so vibrant and full of personality that I couldn’t imagine anyone else illustrating Bob and his great-grandpa Henry. Both issues of Bob: Non-Union Psychic are available from the Warehouse 9 Productions website, for $3.99. 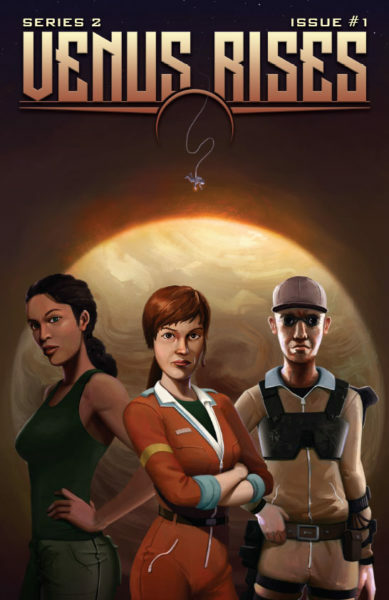 Venus Rises is a solid sci-fi series built around an intriguing twist on the ever popular concept of Mars colonisation. If you’re new to the series, this second volume also does a grand job of plotting out its premise in its initial pages. When a chain of cataclysmic events allowed mega-corporations to take the place of governments on Earth, the working classes were encouraged to help colonise Mars by mining the moon, with the promise of a place among the elite when mankind’s wealthiest were settled on the red planet. Naturally, when this did happen, the wealthy Martians turned back on that promise and instead reallocated the proles to mining operations on Venus. Venus Rises: Exordium follows the disparate lives of salvager Captain Terry Holden and corporate pawn Hollister Pelt III, as hostilities between the Venusian workforce and the Mars privileged loom. 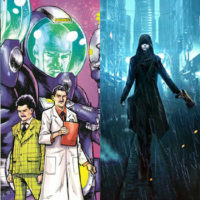 Writer J. G. Birdsall and Thomas Garbarini have forged a fascinating universe, and this is a series that takes its contribution to the science fiction genre very seriously, with some grand establishing shots of Holden’s craft, the Cattywompus, that evoke 70s movies such movies as Dark Star and Alien. Visit http://www.venusrises.tv for more on the series and a store. The series is also now available on Comixology. 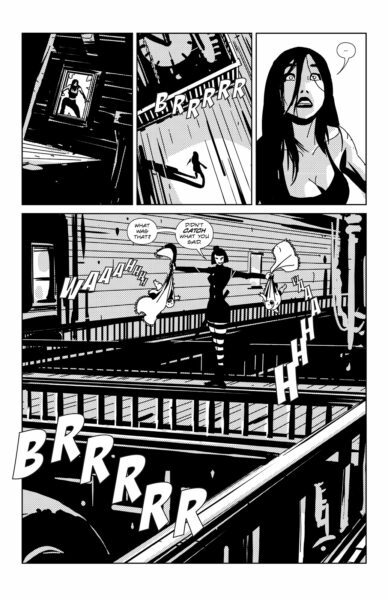 I love, love, love Stephan Franck’s vampire crime-caper Silver, and couldn’t be happier to see it return after a brief pause with this 53-page seventh issue. 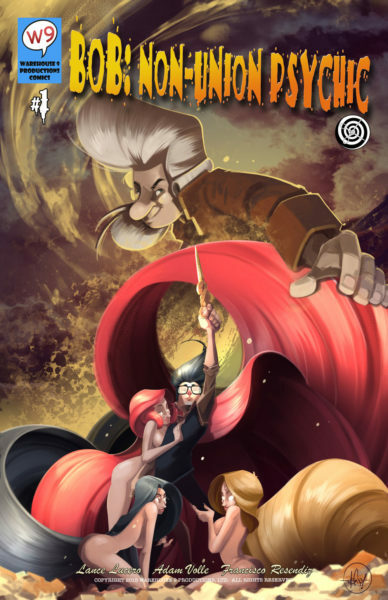 Franck mixes elements from numerous genres and Stoker’s original Dracula novel like some mad alchemist, but the series holds together largely due to strong characters, distinct art, and Franck’s impeccable sense of pacing. This issue is atypically action-packed, and thus lacks the witty noir dialogue that previously enamoured me so, but Franck’s background in animation (he worked on The Iron Giant and Despicable Me) is evident in his ability to illustrate a chaotic 40-page fight sequence between Sledge and her nemesis without once losing the reader’s attention. You’ll find the latest issues of Silver on ComiXology and the Dark Planet Webstore, though I urge fans of either noir comics or vampire mythology to check out the first two volumes immediately. It’s much, much more than just another stale Dracula homage. What the hell did I just read!? At first glance, Katja Vartiainen’s Elves & the Agro Adventure looks like a children’s book about tiny woodland folk, but it’s actually a parody of new age values and our inability to tackle ecological issues with a level head. 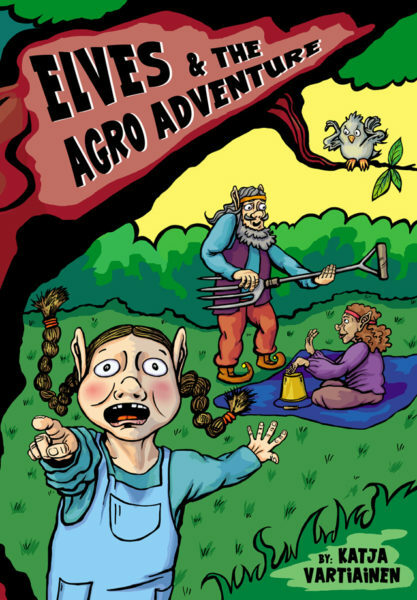 Agro Adventure follows the exploits of a village of hippy Elves whose happy “hedonistic, anarchistic democracy” is torn upside-down when they tragically… run out of coffee. Thus begins a sequence of escapades featuring sly foxes, giant mutant slugs, a sentient corncob and, er… Hugh Jackman. Indeed. 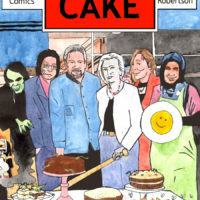 It’s an extremely eccentric comic, but even during the brief moments when I wasn’t laughing at its oddball humour I had a permanent grin affixed to my face. As a po-faced vegan, such material usually riles me up, but Vartiainen writes and illustrates from the heart and her story and ideas are clearly the product of someone who cares about the world but accepts the stereotypes that the environmentally conscious always seem to slip into, often against their very best efforts. Elves &the Agro Adventure is available in paperback from Amazon. Michael David Nelsen’s brilliant science fiction series Supernaut is now available in its entirety. 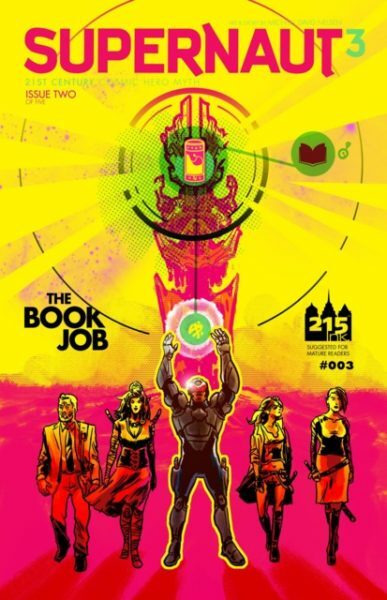 I reviewed the first issue at the end of last year, and while I found it a visual and conceptual tour de force, I did fear that the subsequent issues might not deliver on Nelsen’s grand time and universe hopping narrative. Fortunately, the 5-part series delivers in spades, and is an endless assault on the brain and eyes. 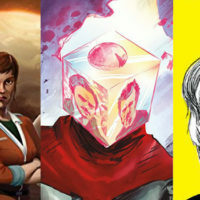 Supernaut‘s plot, which focuses on a group of super-powered rogues as they race through time and alternate worlds to stop God from killing the universe, never runs low on energy or ideas, from Nielson’s varied art styles and imaginative worlds to the character profiles that look as though they’ve been ripped straight out of a yellowed 80s edition of the Official Handbook of the Marvel Universe. 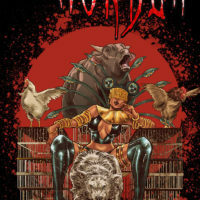 The series can be found on comiXology.